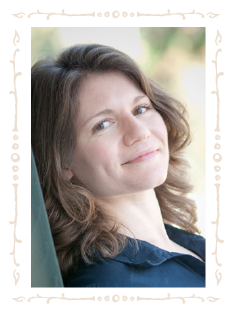 Carolin Starr Rose is the author of May B., and her newest book is Blue Birds. 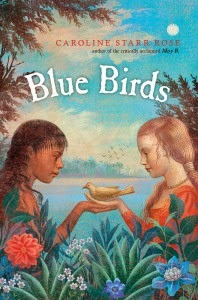 Blue Birds is a novel in verse about two girls, one English and one Roanoke. When the English arrival on Roanoke, tensions between the two groups of people force the girls to make an impossible choice. Caroline is here on the blog to talk about her research process for Blue Birds! Blue Birds is a book I started researching before I realized it. In 2008 I was teaching fifth grade, and we’d just gotten to the passage in our social studies book about the Lost Colony of Roanoke: 117 missing people, the word CROATOAN the only clue left behind. The same shivery fascination that I’d felt as a girl, it was there all over again. Coincidentally, our Scholastic book order had two Roanoke books available at this same time. I bought them and tore through them, telling my students everything I was learning. It was two years later that I finally started researching in earnest with my own book in mind. I’m not an author who is brimming with ideas. I approach historical fiction with an interest in an era or an event and trust that through my reading some sort of story will bubble up to the surface. I always start my work by reading children’s non-fiction. These books give a great overview of an era while I’m in my exploratory phase. Oftentimes they include bibliographies that point me toward scholarly works and first-hand accounts, where I can dig deeper. I use the Internet somewhat (the Fort Raleigh National Historic Site was a great resource while working on Blue Birds, as was the Coastal Carolina Indian Center), but I really prefer buying books and marking them up. I also keep a notebook for each project. It’s full of questions, notes, quotes, ideas, maps, and early character sketches. One challenge I faced in my research is the fact both the Croatoan and Roanoke tribes no longer exist. I could only find one substantial book on the Croatoan and Roanoke, The Head in Edward Nugent’s Hand: Roanoke's Forgotten Indians, which I read several times. I was fortunate enough to find two key readers: the Coordinator of Tribal Youth Programs and Cultural Enrichment for the Lumbee tribe (the Lumbee are believed to have descended from the Croatoan) as well as a North Carolina museum director of Aboriginal Studies. Historical fiction will always hold inaccuracies that range from insufficient research on the author’s part to newly discovered bits and pieces that make old ideas obsolete. I worked very, very hard to learn all I could about this moment in history and the people involved, but I don’t know everything. I hope, though, that I have captured what those few summer weeks in 1587 must have felt like for those who lived them. I hope I’ve challenged readers to think about the things that separate us and the things that bind us together. And I hope I’ve sparked interest in the world’s greatest place to mine a story: the past. Thanks, Caroline! Blue Birds is out now!